Ethics education has dramatically evolved over decades in response to cultural and technological changes affecting social work practice. The year: 1920. Imagine a caseworker employed at Hull House, the famed social settlement in Chicago devoted to easing the burdens of thousands of immigrants doing their best to adjust to the relentless challenges of life in a new land. The workers hired by Hull House founders Jane Addams and Ellen Gates Starr spent countless hours helping people with housing, employment, food, child care, and education, among other basic human needs. The caseworker, eager to enhance her professional skills, learned through the grapevine about a new social work education program offered by the University of Chicago, which recently joined forces with the Chicago School of Civics and Philanthropy. After being accepted into the program, the Hull House staffer enrolled in classes focused on social casework, human behavior, and social policy. No doubt these early courses in one of the social work profession’s bellwether education programs included some discussion of social work’s nascent core values, particularly related to client dignity, worth, privacy, and right to self-determination. Indeed, an experimental code of ethics, published in 1920, has been traced to Mary Richmond, one of social work’s best-known pioneers. For decades following the formal inauguration of social work in the late 19th century, ethics education primarily focused on the nature and application of social work’s core values. Foundation-level courses routinely acquainted students with one or more typologies of social work’s values that developed as the profession created an identity formed by its roots in charity organization societies and settlement houses. Now imagine a 21st-century social worker employed in a hospital-based program that serves people with HIV and AIDS, medical conditions that didn’t exist when social work began. The social worker’s principal duties include addressing mental health challenges that arise among the program’s clients. 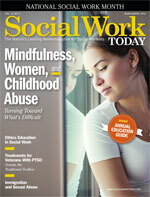 The social worker provides individual and family counseling and facilitates support groups. One of the social worker’s clients contacted the social worker on Facebook and asked to be a Facebook “friend.” Due to his deteriorating health, the client recently moved in with a relative out of state and also asked the social worker if she could provide the client with counseling services using Skype. The social worker was unsure whether she should communicate with a client on Facebook because of the boundary issues or provide clinical services using digital technology across state lines, especially since she wasn’t licensed in the state to which the client moved. To complicate matters, the social worker knows from recent confidential conversations with the client that the client is concerned he may have infected a former sexual partner; according to the client, the former partner is unaware of the client’s HIV/AIDS status. The social worker has encouraged the client to share this information with the former partner, but due to his deteriorating health, the client hasn’t been responsive or proactive. The social worker asked her supervisor whether she has a duty to take steps to notify the client’s former partner about the health risks, even though the client hasn’t authorized such disclosure. The supervisor was unsure about the implications of provisions in the NASW Code of Ethics and several federal and state laws that address confidentiality related to health care and HIV/AIDS. This scenario offers a glimpse of ethical challenges facing today’s social workers that were unimaginable when social work education first began. By necessity, ethics education in social work has been transformed to enhance the likelihood that contemporary social workers can identify, assess, and address challenging ethical issues. Indeed, the evolution of ethics education in social work is among the most remarkable developments in the profession. During social work’s history, there have been several ambitious attempts to highlight the need to educate social workers about values and ethics. The earliest landmark publication on the subject was Muriel Pumphrey’s 1959 volume, The Teaching of Values and Ethics in Social Work Education, published in conjunction with the Council on Social Work Education’s (CSWE) Curriculum Study. In her introductory observations, Pumphrey noted that even though the social work profession was then more than a half-century old, social work educators had not yet produced a comprehensive curriculum or conceptual template for ethics education. She set out to assess how and to what extent content on professional values and ethics was conveyed to social work students. She systematically gathered data from a sample of social work education programs to determine prevailing views concerning social work values and ethics, how they’re applied in practice, and strategies for teaching this content. Pumphrey concluded that curriculum content on values and ethics needed to be considerably strengthened. She found that while the subject of values was pervasive throughout social work instruction, students were, by and large, not receiving systematic instruction on professional ethics. In 1982, nearly a quarter century after Pumphrey’s groundbreaking report, Marcia Abramson and I published The Teaching of Social Work Ethics as part of a series released by The Hastings Center, a professional ethics research center. The Hastings Center project was the first major effort to explore the teaching of ethics in a wide range of professions, including medicine, nursing, law, journalism, engineering, business, criminal justice, the military, public policy, and social work. Our monograph provided an overview of the role of ethics education in social work and examined several pedagogical options and issues. We argued that social work education programs needed to considerably strengthen their efforts to teach content on professional values and ethics. Similar sentiments appear in a subsequent CSWE publication by Elaine Congress, Phyllis Black, and Kimberly Strom-Gottfried, Teaching Social Work Values and Ethics: A Curriculum Resource. Significantly, The Hastings Center report on teaching social work ethics was released when the broader field of applied and professional ethics was beginning to flourish. This isn’t a coincidence. Today’s approach to professional ethics is anchored in the remarkable emergence of the professional ethics field in the 1970s. What began with a primary focus on bioethics (medical and health care ethics) has burgeoned and now includes broad-based efforts to wrestle with and teach about ethical dilemmas in all professions. Journalism students learn about ethical challenges involving protecting confidential sources. Nursing and medical students learn about the ethics of informed consent, genetic engineering, patient privacy, end-of-life care, and allocating limited health care resources. Law school students learn about conflicts of interest, confidentiality breaches, and fiduciary duty. Engineering and business students learn about regulatory compliance and whistle-blowing. In short, especially since the 1980s, ethics education in the professions has been transformed. What once was superficial and cursory treatment of the subject has evolved into a much more deliberate, comprehensive effort to educate professionals about compelling ethical issues that inevitably arise. Based on the remarkable expansion of knowledge regarding social work ethics and current CSWE accreditation guidelines, many ethics education curricula focus on four key themes: the value base of the social work profession and its relationship to students’ values, ethical dilemmas in social work, ethical decision making, and ethics risk management. • Social work values: Social work is among the most values based of all professions. It’s deeply rooted in a fundamental set of values that ultimately shapes the profession’s mission and its practitioners’ priorities. Every social worker has spent time learning about the profession’s deep-seated commitment to client dignity and worth, clients’ right to privacy and self-determination, integrity, social justice, and so on. Occasionally, both students and social work educators encounter challenging circumstances where these values clash. Common examples involve students whose religious beliefs conflict with social work values or school or agency policy or when a student questions social work’s time-honored commitment to addressing issues of discrimination and social injustice. For example, a student whose field internship is in a health care clinic for low-income patients may oppose abortion on moral or religious grounds and, consequently, have difficulty with NASW’s position and her field agency’s policy respecting clients’ right to make decisions about their reproductive health. Or, in class discussion in a child welfare seminar, a student may oppose the adoption of children by gay or lesbian parents—again on moral or religious grounds—and have difficulty reconciling this with her state NASW chapter’s support of pending legislation that would permit adoption by gay or lesbian parents. • Ethical dilemmas: Situations sometimes arise in social work in which core values, duties, and obligations conflict, and these lead to ethical dilemmas. This is when social work students and educators must decide which values—as expressed in various ethical principles and standards—take precedence. Ethical dilemmas that need to be addressed in social work education involve clinical practice, social action and advocacy, administration and management, social policy, and research and evaluation. Typical ethical dilemmas facing clinical social workers involve circumstances where clients’ confidentiality rights clash with social workers’ duty to protect third parties from harm; social workers’ wish to respect clients’ right to self-determination clash with practitioners’ duty to protect clients who engage in self-harming behavior; and complex boundary and dual relationship issues arise (e.g., responding to clients’ questions about a social worker’s personal life, responding to gifts and social invitations offered by clients, managing boundaries when social workers and clients live in rural or other small communities). Social workers involved in social action or community organizing may have to decide whether to comply with an allegedly unjust law or engage in civil disobedience on moral grounds. Social work administrators may have to decide how to allocate limited agency resources, impose budget cuts that affect vulnerable clients, or manage impaired employees. Social workers employed in policy positions may have to decide whether to promote a policy that clashes with social work values. Social work researchers may struggle with informed consent issues or the use of deception when gathering data from clients or other vulnerable people. Social work educators are in a critically important position to help students identify and address such challenging ethical dilemmas. • Ethical decision making: The phenomenon of ethical decision making in the profession has matured considerably in recent years. Today’s social work educators have far more access to helpful literature and concepts related to ethical decision making than did their predecessors. Typically, ethical decision-making frameworks include a series of concepts and steps for students to consider. A widely used model asks students to identify the key ethical issues, including the values and duties that conflict; identify individuals, groups, and organizations who are likely to be affected by the decision; tentatively identify all possible courses of action and the participants involved in each, along with the possible benefits and risks for each; thoroughly examine the reasons in favor of and opposed to each possible course of action, considering relevant ethical theories and principles, codes of ethics, legal principles, social work practice theory and principles, and personal values; consult with colleagues and appropriate experts, such as field instructors, agency administrators, ethics experts and, when appropriate, attorneys; make the decision and document the decision-making process; and monitor, evaluate, and document the decision. Such decision-making protocols don’t guarantee easy or unequivocal decisions. However, they can help social workers structure their decision making and increase the likelihood that they consider key issues. • Ethics risk management: During the earliest chapters of social work’s history, practitioners didn’t need to worry about licensing board complaints or lawsuits alleging violation of ethical standards. In the United States, social work wasn’t formally regulated until the mid-20th century, and it took many years for all of the states and other jurisdictions (District of Columbia and Virgin Islands) to license practitioners. Further, until the late 20th century, social workers were rarely named as defendants in lawsuits. Clearly, times have changed. Today, social work students must be concerned about the risk management ramifications of their ethical decisions and actions, particularly the possibility of licensing board complaints and lawsuits alleging professional malpractice and misconduct. Although relatively few social workers have formal complaints filed against them, this is no longer a trivial risk. By necessity, contemporary social work educators are more sensitive to these issues than their predecessors. It’s important for students and educators to fully understand the ways in which ethical issues and judgments occasionally lead to malpractice claims, ethics complaints filed with professional associations (such as NASW), and licensing board complaints. Key risks involve social workers’ management of client confidentiality and privacy; informed consent; boundaries and dual relationships; conflicts of interest; delivery of services; digital, online, and other remote communications; documentation; termination of services; and practitioner impairment. Ethics education in social work has come a long way. Compared with the profession’s earliest instruction in the late 19th and early 20th centuries, which focused primarily on social work’s core values, today’s education is ambitious with its wide-ranging attention to complex ethical dilemmas, conceptually rich decision-making frameworks, nuanced ethical theories, extensive code of ethics standards, pertinent laws, and practical risk-management strategies. But social workers have learned that ethics education can’t be confined to undergraduate and graduate education. Indeed, in recent years, most licensing boards have expanded their requirements to include mandatory ethics education during each licensing cycle. In addition, many human services agencies that employ social workers now routinely include ethics education in staff development workshops and training. This reflects growing recognition that ethics challenges in social work are not static; novel challenges emerge over time as a result of social changes, cultural developments, and technological innovations. For example, when many of today’s practitioners completed their formal social work education, they couldn’t have imagined contemporary ethical challenges pertaining to social workers’ and clients’ use of digital technology and social networking. Social work knowledge related to ethics has burgeoned, and practitioners need continuing education to keep pace with important developments. Social work’s pioneers in the late 19th century could not have anticipated today’s ethical challenges. Social trends and novel challenges are hard, if not impossible, to forecast. At this stage of social work’s evolution, we now have a firm grasp of enduring and daunting ethical issues faced by practitioners. Our principal duty is to ensure that social workers receive competent and comprehensive ethics education while recognizing that new ethical challenges unknown to us today are likely to arise. Skilled social workers develop the conceptual skills and wisdom required to respond to such unforeseen yet compelling developments.